My name is John Pagani, owner of Kayak East. A native of New Jersey, I have explored the coastal, forested and rural areas of the mid-Atlantic region hiking and mountain biking and traveled the waterways fishing, canoeing, kayaking and stand up paddle boarding. I formed Kayak East because I love the outdoors and want to share it with others! With over 20 years of teaching experience, I have taught thousands of people of all skill levels to kayak and paddleboard safely and efficiently. Whether you are interested in basic instruction or advanced training, our classes are sure to help you learn and hone your paddling skills and technique. If you just want to get out and paddle, our tours will take you to some scenic and pristine places where you can bask in natures beauty as well as some odd and interesting spots a bit off the beaten path. 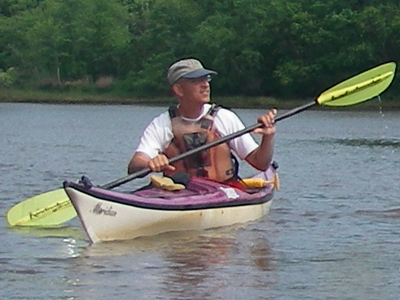 John is certified by the American Canoe Association as a Level 4 Coastal Kayaking/Open Water and Level 1 Stand Up Paddling instructor, the Wilderness Safety Council in Wilderness First Aid and the American Red Cross in First Aid and CPR.